Wednesday’s legislative committees will be abuzz with lots of education bills. School choice, school intervention, curriculum directions….it’s all there. Here’s the Senate Education and Youth Affairs Committee agenda. Meeting starts at 8:30 a.m., with live audio at this link. 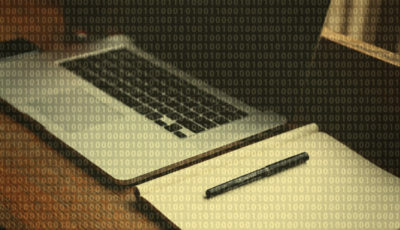 Revisions to the Educational Intervention Act (loosening the definition of when the State Board of Education can intervene), an option for local high schools to offer a virtual high school, and requiring a civics test as a condition of receiving a diploma are up for discussion. Here’s the Senate Finance and Taxation Education Committee meeting agenda, starts at 10:30 a.m. Live audio at this link. 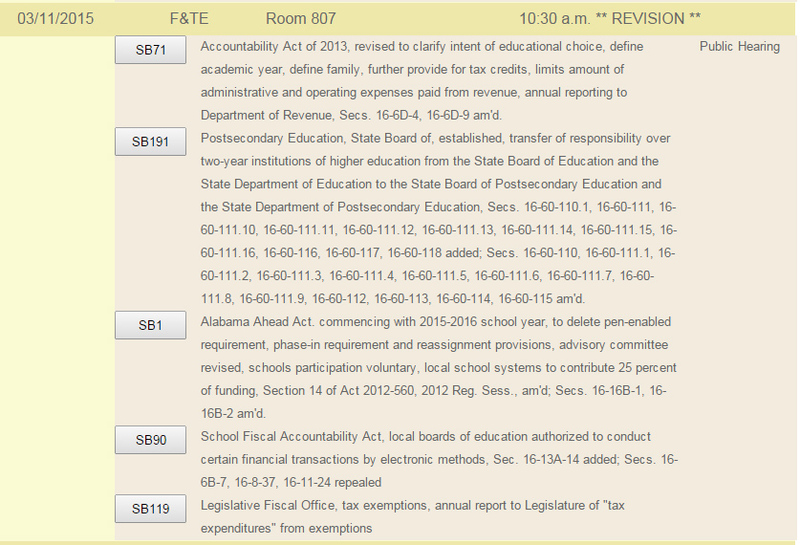 The Alabama Accountability Act revisions (working on an interpretive article now…it’ll be up before midnight here’s a look at the proposed changes), transfer of the two-year college system to a brand new board (away from the State Board of Education), and a reworking of the Alabama Ahead Act…all in one committee meeting. The Senate Judiciary Committee will meet at 1:00 p.m. in Room 325 (no live audio) to consider SB21, which, according to its sponsor, would strengthen the Open Meetings Act to prohibit serial meetings among elected and appointed bodies. The House Judiciary Committee will meet at 1:30 p.m. in Room 429 (no live audio) to consider HB74, a bill to delineate the procedure for issuing a warrant for a public school employee alleged to have committed an offense while performing official duties. 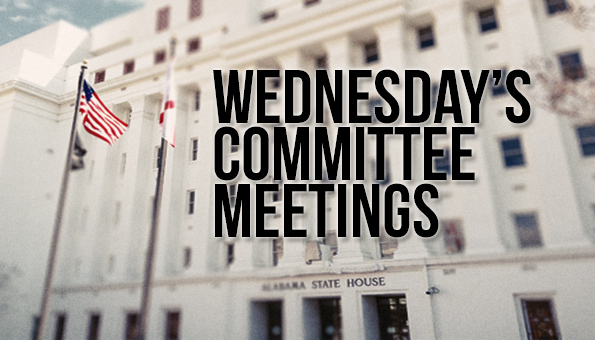 The House Education Policy Committee will meet at 1:30 p.m in the Star Wars Room (Room 807) for a public hearing on HB192, the companion to SB45 (the link takes you to the version the Senate adopted), which would allow public charter schools to operate in Alabama. Here’s the link for the audio. Y’all might remember what will happen if the House passes a different version of a bill than the Senate….a Conference Committee would be called to rectify the two versions. Y’all might remember what happened last time a big education reform bill went into a Conference Committee. It went from a 7-page to a 28-page bill called the Alabama Accountability Act of 2013. This will be watched carefully, for sure. That’s a lot going on in the course of a day. I’ll do my best to keep folks up to date via Twitter and Facebook. Maybe I’ll live-blog the day. If you’re on Twitter, there are some fabulous reporters tweeting live from the statehouse during these committee meetings, including Brian Lyman (@lyman_brian), Mary Sell (@DD_MarySell), Tim Lockette (@TLockette_Star) and Mike Cason (@MikeCasonAL).